Tiger Woods celebrates on the 18th green after winning the 1997 Masters. This story on Tiger Woods' win at the 1997 Masters first appeared in the April 21, 1997 issue of Sports Illustrated. Short and pudgy, he pushed through the crowd, elbowing and worming his way, not stopping for any of the cries of "heyyy, watchit!" as he went. At last he popped through to the front and craned his neck down the line, wide-eyed, hoping to see what he had come for. As Tiger Woods strode past, Jack Nicholson slapped him on the back and grinned, same as everybody else. It didn't matter who you were; if you were there the week everything changed in golf, you just had to reach out and touch a piece of history. Almost 50 years to the day after Jackie Robinson broke major league baseball's color barrier, at Augusta National, a club that no black man was allowed to join until six years ago, at the tournament whose founder, Clifford Roberts, once said, "As long as I'm alive, golfers will be white, and caddies will be black," a 21-year-old black man delivered the greatest performance ever seen in a golf major. Someday Eldrick (Tiger) Woods, a mixed-race kid with a middle-class background who grew up on a municipal course in the sprawl of Los Angeles, may be hailed as the greatest golfer who ever lived, but it is likely that his finest day will always be the overcast Sunday in Augusta when he humiliated the world's best golfers, shot 18-under-par 70-66-65-69-270 (the lowest score in tournament history) and won the Masters by a preposterous 12 shots. It was the soundest whipping in a major this century and second only to Old Tom Morris's 13-shot triumph in the 1862 British Open. When Tiger finally slipped into his green champion's jacket, his 64-year-old father, Earl, drank in a long look and said, "Green and black go well together, don't they?" So golf is trying to get used to the fact that the man who will rule the game for the next 20 years shaves twice a week and has been drinking legally for almost three months now. "He's more dominant over the guys he's playing against than I ever was over the ones I played against," marveled no less an authority than Jack Nicklaus, whose 17-under Masters record of 271 had held up for 32 years. "He's so long, he reduces the course to nothing. Absolutely nothing." It was something to see the way a 6'2", 155-pounder with a 30-inch waist crumbled one of golf's masterpieces into bite-sized pieces. The longest club he hit into a par-4 all week was a seven-iron. On each of the first two days he hit a wedge into the 500-yard par-5 15th hole -- for his second shot. Honey, he shrunk the course. Last Saturday his seven birdies were set up by his nine-iron, pitching wedge, sand wedge, putter, nine-iron, putter and sand wedge. Meanwhile, the rest of the field was trying to catch him with five-irons and three-woods and rosary beads. When Nicklaus said last year that Woods would win 10 green jackets, everybody figured he was way off. We just never thought his number was low. Woods's performance was the most outstanding in Augusta National history, and that figured, because he stood out all week. He stood out because of the color of his skin against the mostly white crowds. He stood out because of his youth in a field that averaged 38 years. He stood out because of the flabbergasting length of his drives -- 323 yards on average, 25 yards longer than the next player on the chart. He stood out for the steeliness in his eyes and for the unshakable purpose in his step. "He may be 21," said Mike (Fluff) Cowan, his woolly caddie, "but he ain't no 21 inside those ropes." Said Paul Azinger, who played with Woods last Friday and got poleaxed by seven shots, "I just got outconcentrated today. He never had a mental lapse." It was a week like nobody had ever seen at Augusta National. Never before had scalpers' prices for a weekly badge been so high. Some were asking $10,000. Even after it was all done, a seemingly useless badge was fetching up to $50 outside the club's gates. Never before had one player attracted such a large following. 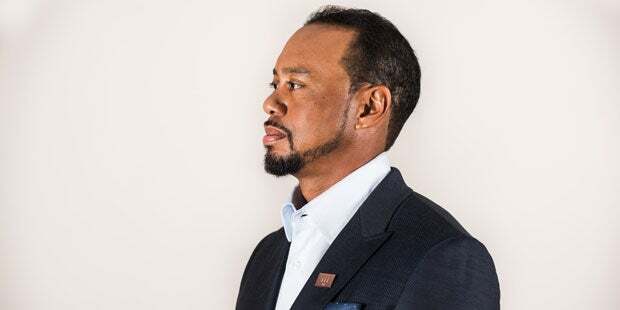 Folks might have come out with the intention of watching another golfer, but each day the course seemed to tilt toward wherever Woods was playing. Everybody else was Omar Uresti. Never before had so many people stayed at the course so long, filling the stands behind the practice range, 1,500 strong, to watch a lone player hit thrilling wedge shots under the darkening Georgia sky. It was the highest-rated golf telecast in history, yet guys all over the country had to tell their wives that the reason they couldn't help plant the rhododendrons was that they needed to find out whether the champion would win by 11 or 12. Away from the golf course, Woods didn't look much like a god. He ate burgers and fries, played Ping-Pong and P-I-G with his buddies, screamed at video games and drove his parents to the far end of their rented house. Michael Jordan called, and Nike czar Phil Knight came by, and the FedExes and telegrams from across the world piled up on the coffee table, but none of it seemed to matter much. What did matter was the Mortal Kombat video game and the fact that he was Motaro and his Stanford buddy Jerry Chang was Kintaro and he had just ripped Kintaro's mutant head off and now there was green slime spewing out and Tiger could roar in his best creature voice, "Mmmmmwaaaaannnnnggh!" By day Woods went back to changing the world, one mammoth drive at a time, on a course that Nicklaus called "much harder than the one I played" when he delivered his 271. What's weird is that this was the only Masters in history that began on the back nine on Thursday and ended on Saturday night. For the first nine holes of the tournament the three-time reigning U.S. Amateur champion looked very amateurish. He kept flinching with his driver, visiting many of Augusta's manicured forests, bogeying 1, 4, 8 and 9 and generally being much more about Woods than about Tigers. His 40 was by two shots the worst starting nine ever for a Masters winner. But something happened to him as he walked to the 10th tee, something that separates him from other humans. He fixed his swing, right there, in his mind. He is nothing if not a quick study. In the six Augusta rounds he played as an amateur, he never broke par, mostly because he flew more greens than Delta with his irons and charged for birdie with his putter, often making bogey instead. This year, though, he realized he had to keep his approach shots below the hole and keep the leash on his putter. "We learned how to hit feeders," Cowan said. Woods figured out how to relax and appreciate the six-inch tap-in. (For the week he had zero three-putts.) And now, at the turn on Thursday, he realized he was bringing the club almost parallel to the ground on his backswing -- "way too long for me" -- so he shortened his swing right then and there. He immediately grooved a two-iron down the 10th fairway and birdied the hole from 18 feet. Then he birdied the par-3 12th with a deft chip-in from behind the green and the 13th with two putts. He eagled the 15th with a wedge to four feet. When he finished birdie-par, he had himself a back-nine 30 for a two-under 70 -- your basic CPR nine. Woods was only three shots behind the first-day leader, John Huston, who moved in front at 18 by holing a five-iron from 180 yards for eagle and then dropped from sight the next day with a double-par beagle 10 on the 13th. Playing in the twosome ahead of Huston, Woods had eagled the same hole after hitting an eight-iron to 20 feet, vaulting into the outright lead, one he would never relinquish. By Friday night you could feel the sea change coming. Woods's 66 was the finest round of the day, and his lead was three over Colin Montgomerie. Last year's two Goliaths in the Masters drama -- Nick Faldo and Greg Norman -- had blown the cut, Faldo 20 shots behind Woods and Norman 15. For Norman, even a pretournament session with motivational speaker Tony Robbins didn't help. Next year: Stuart Smalley. I'm good enough, I'm shark enough and, doggone it, people fear me! "I guess I should start hating this bloody place," Norman said as he left, "but I can't." Saturday was nearly mystical. As the rest of the field slumped, Woods just kept ringing up birdies. He tripled his lead from three to nine with a bogeyless 65. You half expected him to walk across Rae's Creek. Even when Masters officials warned him for slow play on the 14th, he kept his head. That night there was this loopiness, this giddy sense, even among the players, of needing to laugh in the face of something you never thought you'd see. A 21-year-old in his first major as a pro was about to obliterate every record, and it was almost too big a thought to be thunk. "I might have a chance," said Paul Stankowski, who trailed by 10, "if I make five or six birdies in the first two or three holes." After playing with Woods on Saturday, Montgomerie staggered in looking like a man who had seen a UFO. He plopped his weary meatiness into the interview chair and announced, blankly, "There is no chance. We're all human beings here. There's no chance humanly possible." What about last year? he was asked, a reference to Norman's blowing a six-shot lead and losing the Masters to Faldo by five. "This is very different. Faldo's not lying second, for a start. And Greg Norman's not Tiger Woods." Only 47-year-old Tom Kite, who would finish second in the same sense that Germany finished second in World War II, refused to give up. He was a schnauzer with his teeth locked on the tailpipe of a Greyhound bus as it was pulling into beltway traffic. How can you be so optimistic when Woods is leading by nine shots? "Well," said Kite, "we've got it down to single digits, don't we?" But Kite did not leave Augusta empty-handed. As the captain of a U.S. Ryder Cup team that will try to reclaim the trophy from Europe this September in Spain, he suddenly has a one-man Ryder Wrecking Crew on his hands, for Woods wiped out his playing partners from overseas: England's Faldo by five shots on Thursday, Scotland's Montgomerie by nine on Saturday and Italy's Costantino Rocca by six on Sunday. The last round was basically a coronation parade with occasional stops to hit a dimpled object. There seemed to be some kind of combat for mortals going on behind Woods for second place, but nothing you needed to notice. Nobody came within a light year. Rocca and Tom Watson each trimmed the lead to eight, but mentioning it at all is like pointing out that the food on the Hindenburg was pretty good. Woods went out on the front nine in even par, then birdied the 11th, the 13th and the 14th and parred the 16th with a curvaceous two-putt. "After that, I knew I could bogey in and win," he said. That's a bit of an understatement, of course. He could've quintuple-bogeyed in and won. He could've used nothing but his putter, his umbrella and a rolled-up Mad magazine and won. He wanted the record, though, and for that there was one last challenge -- the 18th. On his tee shot a photographer clicked twice on the backswing, and Woods lurched, hooking his drive way left. On this hole, though, the only trouble comes if you're short or right, and Woods has not been short since grade school. He had a wedge shot to the green -- if only he could get his wedge. Fluff was lost. "Fluff!" Woods hollered, jumping as if on a pogo stick to see over the gallery. Fluff finally found him as the crowd chanted, "Fluff! Fluff!" It was not exactly tense. Still, Woods needed a five-footer for par, and when he sank it, he threw his trademark uppercut. The tournament he had talked about winning since he was five, the tournament he had watched on tape almost every night in his little suburban bedroom all those years, the tournament he had wanted more than all the others, was his, and the dream had only just begun. He was now the youngest man by two years to win the Masters and the first black man to win any major. He turned and hugged Fluff, and as the two men walked off the green, arms draped over each other's shoulders in joy, you couldn't help but notice that Chairman Roberts's Rule of Golf Order had been turned happily upside down -- the golfer was black and the caddie was white. "I've always dreamed of coming up 18 and winning," Woods, still a little shocked, said after slipping on the green jacket. "But I never thought this far through the ceremony." So golf is all new now. Everything is a fight for place. Win seems to be spoken for. If you are the tournament director of a PGA Tour event, you better do whatever's necessary to get Tiger Woods, because your Wendy's-Shearson Lehman Pensacola Classic is the junior varsity game without him. The Senior tour seems sort of silly next to this. A babe in swaddling pleats with a Slinky for a spine and a computer for a mind had just won a major by more shots than anybody this century. How does he top this? The Grand Slam? "It can be done," he said, unblinking. "The bigger the event, the higher he'll raise the bar," Azinger said. "He's Michael Jordan in long pants." Of course, much more than golf was changed at Augusta National last week. As Woods made his way from Butler Cabin and an interview with CBS, he brought his phalanx of Pinkerton guards and other escorts to a sudden stop. Out of the corner of his eye Woods spied Lee Elder, the man who at 39 had finally won a PGA Tour event, the Monsanto Open, earning his invitation as the first black man to play the Masters, in 1975, the year Tiger was born. Woods knew Elder's story, knew about Teddy Rhodes, too, the star of the black golf circuit in the 1940s, who might've won here if he'd had the chance; and of Charlie Sifford, who outplayed Masters champions like Doug Ford and Gay Brewer regularly on the Tour but never qualified to play here; and of his own father, who was the first black man to play baseball in the Big Eight and was often forced to stay in separate hotels and eat in separate restaurants, apart from his teammates. Tiger knows all the stories he never had to live, so he stopped and put a giant bear hug on Elder. "Thanks for making this possible," Woods whispered in his ear, and then the parade swept on. Elder had tears in his eyes. At the very end Woods made it into the elegant Augusta National clubhouse dining room for the traditional winner's dinner. As he entered, the members and their spouses stood and applauded politely, as they have for each champion, applauded as he made his way to his seat at the head table under a somber oil painting of President Eisenhower. But clear in the back, near a service entrance, the black cooks and waiters and busboys ripped off their oven mitts and plastic gloves, put their dishes and trays down for a while, hung their napkins over their arms and clapped the loudest and the hardest and the longest for the kind of winner they never dreamed would come through those doors.